FiftyThree is celebrating graphs on Paper, the award-winning iPad app. Here at FiftyThree, we’re building something new to bring ideas together using a special kind of database called a graph database. 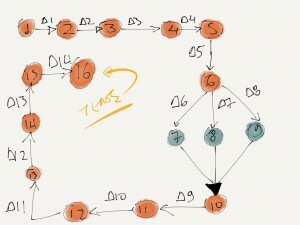 One such graph database is NEO4J built by our friends at Neo Technology. To celebrate graphs and connected data, Neo Technology will host GRAPHCONNECT 2012 — the first graph database conference ever — on November 5th and 6th. As users of Neo4j, we’ll be attending and sharing our experiences on a panel. To coincide with the conference, GraphConnect is running a contest called SHOW ME YOUR GRAPH to discover creative graphs. There will be prizes, so check out the contest page for full details. If you love graphs as much as we do, share yours on Paper by Monday, October 29! Read the full article.